Alice and Harry Artemis at The Columbine Cafe, which has been in their family for 80 years. In the eighty years since Mike Hatzis, a Greek immigrant and World War I veteran, opened the Columbine Café, the area has seen some dramatic changes. Located near the Coors Brewing Company in Golden, Colo., what used to be horse pastures is now an outlet mall, a Super Target, and rows of car dealerships. And a bar that used to be packed from 7 a.m. to close now struggles to survive. 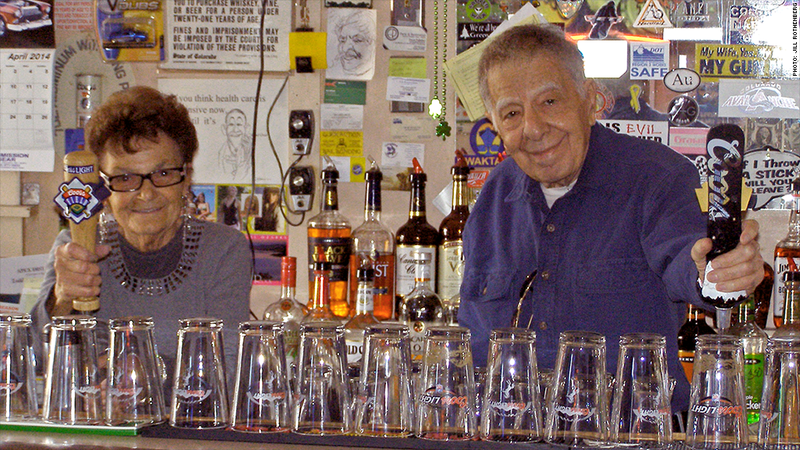 Current owner Harry Artemis, 84, Hatzis's nephew, bought the bar in 1976, while he was working at Coors. For decades, he catered to a generation of Coors workers who are mostly long retired. "We've got only two kinds of beer on tap -- Coors and Coors Light," his son Chris, 53, said. The Columbine is in Pleasant View, Colo., a tiny community of 4,000 squeezed between Denver suburbs Golden and Lakewood. Surrounded by encroaching development, Pleasant View's population declined 2% from 2000 to 2010. The bar -- with nine barstools, four booths and three tables -- long served as the community's living room. "We were the workers' bar," said Harry's wife, Alice, 84, who opened the bar at 7 a.m. every morning with her husband through the 1970s and '80s. "You had the guys who got off their shift at Coors and the telephone company guys -- just regular people. But it felt like a family." Longtime customer Danny Kerr, 71, can attest to that. "It used to be packed after work and all the time," said Kerr, who worked for 50 years at Coors. "But I think now I'm one of the only ones still standing." 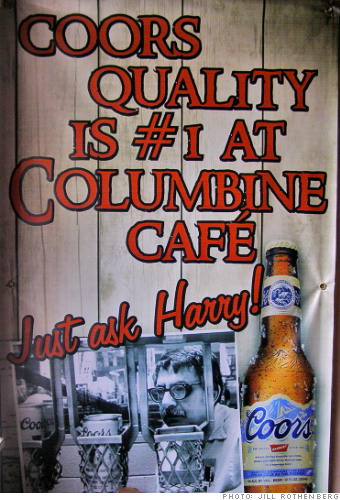 Up until a year ago, Harry was still opening the bar every day. Now, even though Chris and his siblings all have full-time jobs, they work nights and weekends at the Columbine. Because even with the decline in business (they used to go through two kegs a day; now it's just one), the bar is an important piece of their family history. "My brother and I used to have to clean the bar every morning before school," said Chris, who runs a ski tuning business in the same building. "He'd clean one half and I'd clean the other. My Great Uncle Mike would give us each a fifty-cent piece for doing it." It's also full of local history. Western film star Pete Morrison, who owned a nearby ranch and taught John Wayne how to drive a horse-drawn carriage, used to ride his horse to the bar. "There was a hitching post in the front at that time," Harry said. Alice says the bar's no-nonsense reputation was well established. "Uncle Mike, back in the day, kept a rifle behind the bar and wasn't afraid to take it out if he sensed someone was up to no good. That's how he kept order." Chris attributes the decline in business to a variety of factors, but said Colorado's 2006 smoking ban "really hurt us," cutting yearly net revenue from the mid-six figures to five figures. "If we didn't own everything -- the building and the property -- we would be in even worse shape," he said. "The smoking ban made a lot of regulars look for other places to go, including the VFW up the street. We really suffered." But they've worked hard to keep customers. After the smoking ban took effect, they built a landscaped beer garden in the back, which has helped offset the loss, especially in the summer. From May to August, they have barbeques, bands, and rent out the space for events. "It's gotten to the point where we have to think of guerrilla marketing strategies," son Chris said. His brother Steve organizes summer fish fries and pig roasts; and summer horseshoe tournaments have attracted a younger clientele. "We've been seeing a big burst of kids in their twenties who are interested in the place and are just discovering it," said Chris. They also host a weekly "Wax and Suds" event through his firm Saucerwax. "We can get up to 30 tune-ups on a Thursday night during ski season, and those people bring their friends." he said. "Anything to keep it going."